More and more, artists are realizing that they need to take control of their online web presence. 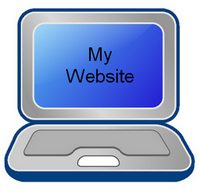 You need to build and maintain your own website, unless, of course, you can afford to pay someone else to do it for you. But if you want to do it, then here are some reasons that I recommend you give WordPress.com a whirl. At the time of this writing they have around 141 free themes and 70 premium themes. In that collection, there are 23 responsive themes which are becoming very popular because of the many device sizes in existence. The variety is large enough to find a theme that suits any personality and style. For artists, the important thing is to find a clean, simple theme that allows their artwork to do the speaking. Sharing is available as well as auto sharing your blog posts. Many artists hate how much time this whole process can take. So being able to automate these things is a real plus. I know there are still artists who have no desire for blogging and want only to build a more traditional website to house an online portfolio. Yes, you can do that with WordPress. Of course, I always recommend blogging to be part of the website to help increase traffic, but everyone has their preferences, and WordPress accommodates that. Artists can be very obsessive type people. Face it; it can be a main ingredient for great art. But not all obsessions are good. Flash driven websites fall into the “not good” category. But they look so cool…. Artists are visual, so they are naturally drawn to these flashy websites. In fact, companies that build them know this. And they go out of their way to target artists, especially photographers. Who doesn’t want their big beautiful images scrolling in front of potential customers? They are not at all search engine friendly – those potential customers will never find you. The viewer loses much of the control in moving through a flash website. Maintenance never gets done. Once a string of images has been loaded, artists never want to go back and deal with it again. There are no “inside” links to the website. There is no way to link directly to a specific image or page within the website. A flash website works contrary to the rest of the web world. And it doesn’t take much to frustrate visitors on websites. Simplicity is always best. If you’ve been thinking about getting one of these flash driven websites for yourself, well… you may want to rethink that and take some time to investigate your options.